Today I spent hours on the etsy forum threads trying to promote my shop and came across some really talented sellers/products and one that caught my eye is http://magnolyadesigns.etsy.com. 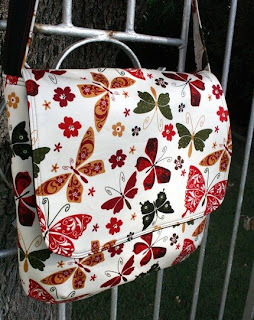 She was promoting a butterfly messenger bag and it's gorgeous, click on the title and it should bring you to her shop and the bag. Not only is it gorgeous, but the price is affordable too - $20, and $4 for shipping - I say that's just awesome, you'd pay the same if not more at Target (don't get me wrong I love target) but this is handmade and her fabric is just lovely. It's fall colors with beautiful butterflies, I have to have it. She's making me a custom one, I'm picky and would like the print on the outside of the strap; but she said she can make it in one day and ship it out - and she has a 2 year old; how does she do it? Her story is also nice, she started her store to help raise money for the adoption of twins - that's really sweet, so go stop in her shop and check out her stuff. She has messenger bags, magnets, and the cutest kimono style baby booties, makes me wish my little one was that small again; well maybe not but they're adorable - and she has really nice fabric patterns. That's my favorite for today.